O.J. Simpson piled up a monumental record in two seasons at USC. In 18 games he gained 3,187 yards, scored 21 touchdowns in 1968 and 13 in 1967. His 40 carries in the UCLA game his senior year gave him an NCAA record of 334 for one season. His 205 yards in that game swelled his season total to 1,654 for another NCAA record. He was the second Heisman Trophy winner from USC. Since graduation O.J. has become not only a legendary rusher in NFL, but also an actor, and an advertising pitchman. He closed out a great football career in 1979 with the '49ers. He went on to be seen on television and movie screens regularly. He was a sports broadcaster for NBC and ABC. He owns and is CEO of two companies, Orenthal Productions and O.J. Simpson Enterprises. O.J. was elected to the National Football Foundation and College Hall of Fame in 1985. O.J. 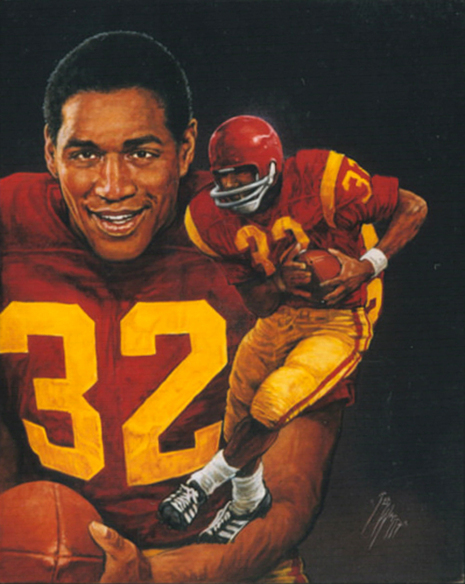 Simpson, USC's standout tailback, won in the biggest landslide in Heisman history. Simpson accumulated the most points (2,853) and the widest margin of victory (1.750) in the balloting as he swept all five regions. Terry Hanratty, who broke George Gipp's total yardage records at Notre Dame, was a distant third, but remains one of the few players to finish in the top 10 in Heisman balloting as a sophomore, junior and senior. Orenthal James "O. J." Simpson (born July 9, 1947), nicknamed "The Juice", is a retired American football player, football broadcaster, actor, and spokesman. He originally attained fame in sports as a running back at the collegiate and professional levels and was the first NFL player to rush for more than 2,000 yards in a season, a mark he set during the 1973 season. While four other players passed the 2,000 rush yard mark he stands alone as the only player to ever rush for more than 2,000 yards in a 14-game season (the NFL changed to a 16 game season in 1978). He also holds the record for the single season yards-per-game average which stands at 143.1 ypg. In 1995, Simpson was acquitted of the murder of Nicole Simpson and Ronald Goldman after a lengthy, highly publicized criminal trial. A 1997 judgment against Simpson for their wrongful deaths was awarded in civil court by a jury, but to date he has paid little of the $33.5 million judgment. He gained further notoriety in late 2006 when he wrote a book titled If I Did It. The book, which purports to be a first-person fictional account of the murder had he actually committed it, was withdrawn by the publisher just before its release. The book was later released by the Goldman family. In September 2007, Simpson was arrested in Las Vegas, Nevada and charged with numerous felonies, including robbery with a deadly weapon, burglary with a firearm, assault with a deadly weapon, first-degree kidnapping with use of a deadly weapon, coercion with use of a deadly weapon, conspiracy to commit robbery, conspiracy to commit kidnapping, and conspiracy to commit a crime. A jury found Simpson guilty of all charges on October 3, 2008; and he was sentenced on December 5 to at least nine years in prison. He is currently serving his sentence at the Lovelock Correctional Center in Lovelock, Nevada. Simpson earned an athletic scholarship to the University of Southern California where he played running back in 1967 and 1968. Simpson led the nation in rushing in 1967 when he ran for 1,451 yards and scored 11 touchdowns. He also led the nation in rushing the next year with 355 carries for 1,709 yards. In 1967, he starred in the 1967 USC vs. UCLA football game and was a Heisman Trophy candidate as a junior, but he did not win the award. His 64 yard touchdown run in the 4th quarter tied the game, with the PAT the margin of victory. 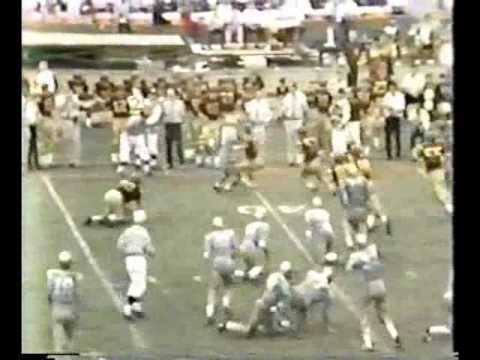 This was the biggest play in what is regarded as one of the greatest football games of the 20th century. 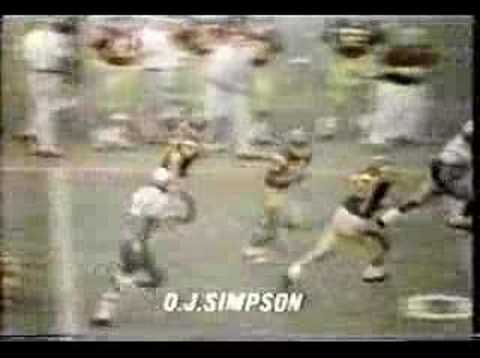 Another dramatic touchdown in the same game is the subject of the Arnold Friberg oil painting, O.J. Simpson Breaks for Daylight. Simpson also won the Walter Camp Award in 1967 and was a two-time consensus All-American. He ran in the USC sprint relay quartet that broke the world record at the NCAA track championships in Provo, Utah in June 1967. In 1968, he rushed for 1,709 yards and 22 touchdowns, earning the Heisman Trophy, the Maxwell Award, and the Walter Camp Award that year. He still holds the record for the Heisman's largest margin of victory, defeating the runner-up by 1,750 points. 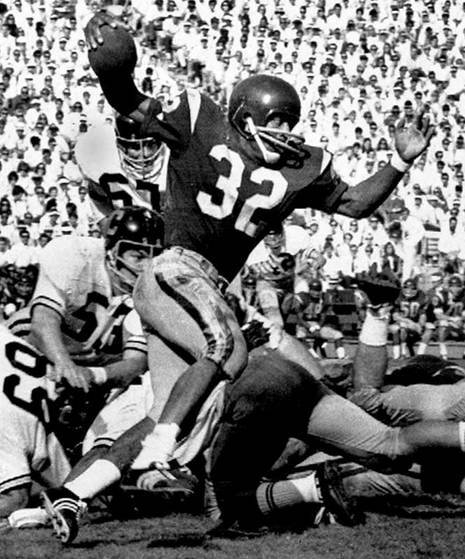 In the 1969 Rose Bowl where #2 USC faced #1 Ohio State, Simpson ran for 171 yards, including an 80-yard touchdown run in a 16-27 loss to top ranked Ohio State. 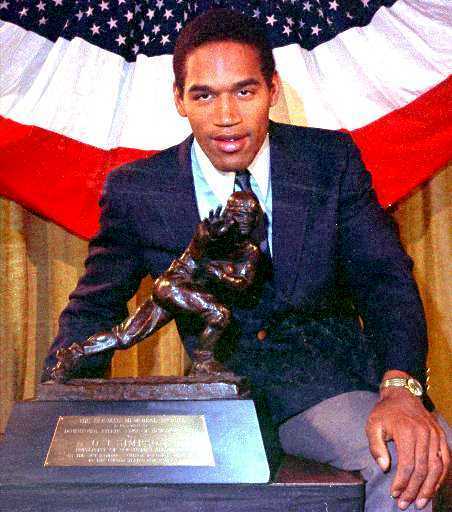 Orenthal James Simpson (born July 9, 1947 in San Francisco, California), publicly known by the initials O.J., and nicknamed The Juice, was a Hall of Fame college and professional football player and film actor. Although considered to be one of the greatest running backs of all time, Simpson is most recently known for being charged with the murder of his ex-wife Nicole Brown Simpson and her friend Ronald Goldman in 1994. He was acquitted in criminal court in 1995 after a lengthy, highly publicized trial (often called the Trial of the Century). Subsequently, Simpson was found liable for their deaths in civil court in 1997. While attending Galileo High School in San Francisco, Simpson played for the school's football team, the Galileo Lions. After originally playing in Junior College at the City College of San Francisco, his talent landed him at the University of Southern California (USC) and won him the Heisman Trophy, Maxwell Award, the nickname "The Juice", induction into the College Football Hall of Fame and the distinction of being the first player selected in the 1969 professional football draft after winning the Heisman Trophy. Simpson was selected by the American Football League's Buffalo Bills, who held the first selection in the draft after finishing 1-12-1 in 1968 — the worst record in professional football. Early in his NFL career, Simpson struggled on the poor Buffalo teams averaging only 622 yards per season. He first rushed for 1,000 yards in 1972. In 1973 Simpson ran for a then-record 2,003 yards, becoming the first player ever to eclipse the 2,000 yard mark, and was voted the league's Most Valuable Player. Although his 2,003 yard season has subsequently been eclipsed by four running backs, only Barry Sanders managed to match Simpson by rushing for 2,000 or more yards in 14 games (Weeks 3-16 of the 1997 season; including Weeks 1 & 2, Sanders rushed for 2,053 yards. Eric Dickerson holds the 16-game season and overall records with 2,105 yards rushing in 1984). Simpson's yards per game average was ten yards higher than that of the closest competitor. "The Juice" powered one of the league's top rushing offenses, and ran behind the famed "Electric Company" offensive line. His 1973 performance earned him the Hickok Belt as top professional athlete of the year. Over his career, Simpson ran for an NFL record 6 200-yard games, three of which occurred in 1973. He also had back-to-back 200 yard performances in both 1973 and 1976. Simpson went on to earn All-Pro honors five times. He finished his 11-year career in 1979 with 11,236 rushing yards, 203 receptions for 2,142 receiving yards, and 75 touchdowns(61 rushing and 14 receiving). After being traded to the San Francisco 49ers in 1978, Simpson retired from the NFL the following year, and on January 23, 1985 became the first Heisman Trophy winner elected to the Pro Football Hall of Fame. He is a member of the Bills' Wall of Fame.